That's right, believe it. 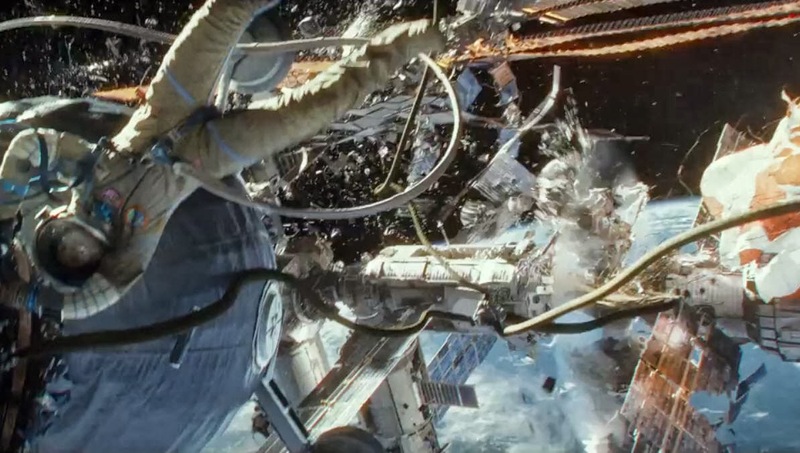 Everything you have heard about Alfonso Cuaron's "Gravity" is true. It is a stunning masterpiece, an example of an artist in complete control of his craft. Its a great showcase by two veteran actors and features some of the best visuals of the year. Its a simple story, Dr. Ryan Stone (Sandra Bullock) is on her first mission on-board The Explorer. She is alongside Matt Kowalski (George Clooney) and everything seems to be going well. All of a sudden, Houston informs the astronauts that debris from Russian missile strike on a debunked satellite has caused a violent chain reaction. The mission must be aborted immediately, Stone and Kowalski do everything in their power to shut down quickly, but communications is lost, the debris hits, and the two astronauts go sailing in the ever long darkness. The rest of the film is revolves around these two working together to get to a nearby space station and eventually rescued. First of all, we cannot enter into a discussion on "Gravity" without mentioning visuals. The film had a one hundred million dollar budget, and you can tell every penny was on the screen. The film is beautiful to watch, completely breathtaking. The detail on the planet, one side facing the sun and the other the moon, is awe-inspiring. The look of the crashes and space is epic. One of the best visual scenes occurs when Stone and Kowalski come across a deceased body of one of their colleagues, the camera zooms in on the deceased' face. We can tell a piece of debris hit this guy in the face and went straight through. It maybe gruesome, but the detail to the gaping hole, the make-up of death, the entire look of it all...its quite the sight. George Clooney and Sandra Bullock do incredibly well. They prove more and more why they are some of Hollywood's most valuable actors. Bullock in particular really steps up to the plate, as she has a tad more screen time than Clooney does. Bullock is playing upon all of the strengthes she has ever had as an actress. Even though I have always been a Bullock fan, I have not always cared for her choices, however I have really enjoyed this half of her career and I hope she continues to inspire. Clooney's character is really cool to watch. Kowalski is the type of guy to joke around in a tense situation, the guy who charming even in the face of demise. Its a great character for Clooney and he really jumps right into the role. There are a couple of other small performances, Ed Harris shows up as voice command on Earth. Harris has always had a commanding voice and he uses it with profound effect. If you got dizzy during the trailers, you'll get dizzy during the movie. "Gravity" is a dizzying thrill ride, but most of those scenes are early in the film and are over before they really begin. You'll see lots of nods to other great space films like "2001: A Space Odyssey," "Alien," "The Right Stuff," "Apollo 13," and "Solaris." But "Gravity" isn't some homage movie. This is a movie with its own theme's and own voice, but it definitely evokes the list of films above. Another thing I loved was throughout all of the film's tension, there are some nice snickers that will put a brief smile on your face. No doubt though, you will be transfixed on everything onscreen. So like I said, believe the hype. "Gravity" is something you should go see, now! X-Men: Days of Future Past trailer!!!! Captain America: The Winter Soldier trailer! Weekly Top Ten- My Favorite Animated Movies! Weekly Top Ten- The 10 Story Catch-up!